Pretty much everyone has heard of Pixar and has seen at least one of their movies. If you’re a parent, like me, then it’s a safe bet you’ve seen all their movies more then you’d care to admit. Pixar isn’t just for kids, their movies speak to people of all ages and situations. How do they do that? Because they follow a few key “rules” that us as writers/authors have scene circulate through the internet for a few years now. Not only are their “rules” a great spring board to write a story for any genre but the music that plays in the background of all their movies can help inspire and guide you through certain scenes. Many writers use music as inspiration and/or a way to focus while writing. Some use white noise or nature sounds, some use their favorite songs, others use classical. I find that all of those techniques work in their own way but my absolute favorite is to use film scores. Not only is there a lack of singing that tends to distract me but the music is geared specifically to make you feel a certain way for a certain scene. There are different ways to use film scores to help inspire your writing. You can pick one movie soundtrack that mimics what your story is about and play the whole thing or pick out a few songs that you like then listen to them on a constant loop. You can pick a favorite composer and create a Pandora station so that you get a mixture of songs from different albums. You can do some research and find the composers you like the best and then listen to samples of their songs and purchase the ones you like. Then you can either pick one or two to play for a certain scene or just let them all play. You can pick a theme like “Pixar Playlist” and create sections to place the different songs under that pertain to that type of scenes you will write in your story. Then, when you are writing a certain scene you listen to the selections that fit that scene description. Side note: Mixing up the music is a good exercise to try at least once. What do I mean? Say you have a romantic scene you need to write. You can just play romantic film scores or you could throw in a few songs that you would normally use for Intense scenes or scenes of conflict. Why? Because while you are in the process of writing your scene the intense song will pop on and all of a sudden your love scene gets more depth, it finds an intensity it wouldn’t have found before on just romantic music. Below are songs that “spoke” to me off of each Pixar movie soundtrack. I listened to a sample of every song before deciding what category to put it in. This is something that is highly personal. If you listen to a song and think I’m crazy for putting it in the scene section that I did, that’s completely ok. Music effects everyone differently. I just hope that you use this play list as inspiration to create one of your own. The sections I have created are (1) Breather/Light-Hearted Scenes (2) Fast-paced Scenes (3) Romantic Scenes (4) Intense/Conflict Scenes (5) Ominous/Dread Scenes (6) Action/Climax Scenes (7) Closing Scenes. Enjoy! 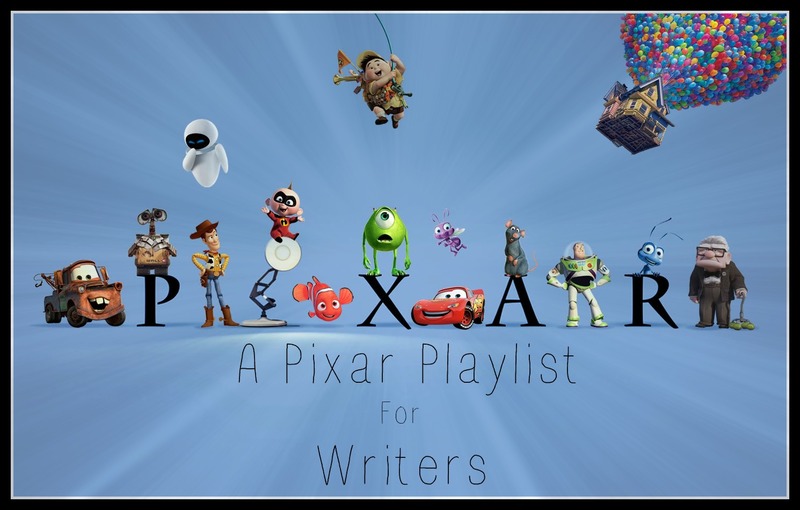 This entry was posted in Writing Resources and tagged A Bug's Life, A Pixar Playlist: 204 Songs to help inspire your next scene, Brave, Cars, Cars2, Darla G. Denton, Finding Nemo, Michael Giacchino, Monster's Inc, Monster's University, Patrick Doyle, Pixar. Pixar Playlist, Randy Newman, The Incredibles, Thomas Newman, Toy Story, Toy Story 2, Toy Story 3, Up, Wall-E. Bookmark the permalink.